Mini Pumpkin Tealight Holders | Get Messy! For our Hallowee’en party this year we are hoping to provide a spooky atmosphere by using candlelight only for illumination. I’ve purchased flameless LED tealights for the occasion – they give off that flickering glow so they look pretty similar to the real thing – without the fire hazard! Tealights are boring on their own, so I am creating mini pumpkin tealight holders – festive and practical! Plus the best part is that they only take about 5 minutes to make! They should last about a week or so – depending on the state they were in when bought. These work really well as Thanksgiving centre pieces or just for fall décor. p.s. if you happen to own a drill press with a 40 mm bit then you can do these in about 2 minutes – and no need to remove the guts! Step 1: cut out the top of the mini pumpkin on an angle and be careful to not push too hard as you may puncture right through to the bottom. Holding the pumpkin by its side (not the bottom) can cut down on potential puncture wounds! Step 2: Trace your tealight to estimate the size of the hole you will need to cut. Step 3: cut away at the sides of the hole, this is just a rough cut – we’ll smooth out the edges later. Cut just enough so that you can get your spoon inside (don’t go outside your lines!). Step 4: Take your spoon and get rid of all the guts – the more you can get out the better! Step 5: I found the vegetable peeler to be a great tool to clean up the edges of the hole and to gradually make it big enough so that the tealight fits in flush with the top of the pumpkin but is still snug. Use the papertowel to wipe off the guck from the exterior and even wipe out the inside a little bit. Step 6: Since I’m using flameless LED tealights, I’m wrapping them with a little bit of foil so that they don’t get too “gunky” – you can barely see it when it’s finished. You can also use the foil if you have mistakenly cut too big! Step 7: Turn on/light your mini pumpkin tealight and enjoy the oohs and ahhs from party guests! I bought these to use in mini pastlic jack-o-lanterns we hung on a Halloween tree in our yard. They fit perfectly inside the containers and the tree looked so cool all Halloween night. They really do flicker and just looked awesome illuminating those little containers. I am going to use them in our Christmas luminaries, I like them so much.I am very pleased with no more worries about the candles burning down or the wind blowing them out. 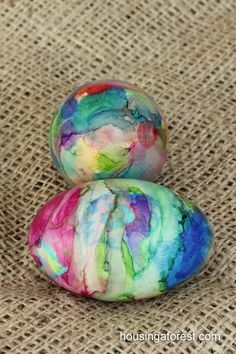 Sharpie Tie Dye Easter Eggs ~ Simple technique with beautiful results. 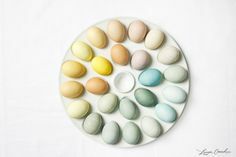 Fun way to color Easter Eggs!